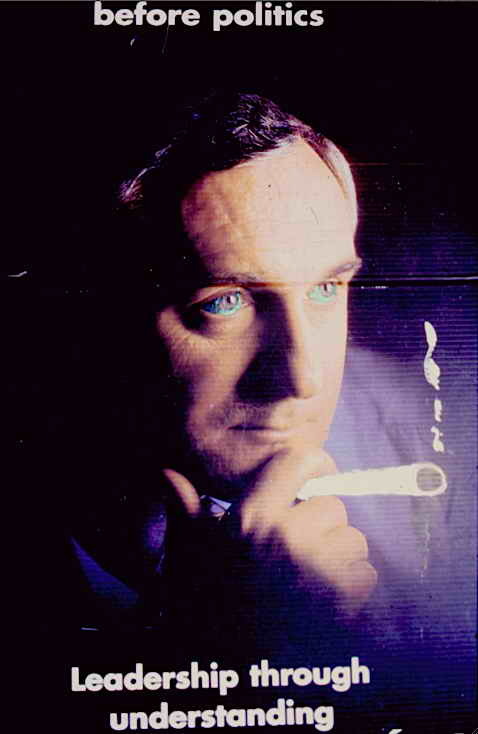 The most memorable staged image from the 1997 Fianna Fáil election campaign remains the quasi-religious poster of Bertie Ahern aglow under the text ‘People before Politics – leadership through understanding’. This directed image, as well as notable for being a radical change from the usual poster layout associated with previous Fianna Fáil campaigns, is also a mark in time for many cultural and historic reasons. Visually, the impact was particularly strong outside the Pale as the design broke with decades of poor layout and plain speak familiar to rural audiences. Previous campaigns had favoured a design template with a blank space left to insert the local candidate’s (often rudimentary) portrait that had remained unchanged more or less for generations. It reflected a design process which continuously gave an appearance of inclusion. Its simplicity united the grassroots and politicians with no more than a picture and a timely slogan. Through repetition these codes became naturalised. ‘Lets make it work for Ireland’ was one such one from the 80s, ‘ ‘For another Spurt Forward !, Vote Fianna Fáil is the actual copy from the 1961 campaign. For generations the rural electorate were key and were not to be distracted by excess gloss or ambiguity at campaign time. A simple reminder in plain language with the image of the candidate and party / tribal colours would suffice. Hence the radical turn experienced when the slick international style of the 1997 posters appeared on Galway ESB poles. Long gone was the party’s statement of 1978 that sought ‘ by suitable distribution of power to promote the ruralisation of industries essential to the lives of the people as opposed to their concentration in the cities’. The culture of the developer was on the rise and with it an increase in percieved sophistication that it was thought proper to disseminate via the election poster. For this design, the saintly glow eminating from the poster was intended to depict Ahern as a Karsh-lit matinee idol, a reassuring Hollywood father figure shepherding the flock through boom times. New imagery was required to emphasise the significance of how the boom was to be managed, so out went the flat evenly lit expressionless black and white head shot. What seemed to be required was dimension and atmosphere. This didn’t take much. With simple change of setup and with the use of a corporate type of side lighting the desired narrative was created. The key light then became a light of reassurance. It signified that the chief was up late, in Dublin, listening and looking out for us all. In the poster, sporting make-up and a quiet determination, the chief stares towards the middle distance. A fixed image that could be read as half listener in a pub clinic for the western audience and half Rodin’s Thinker for cosmopolitan Dublin. As for the campaign, the visual package was intended to be, as usual, nothing more than a transient statement printed on plastic to be recycled after the campaign. A visual that reflected power as it stood and as it stood to be managed. As a portrait it was not produced for archival purposes and certainly not future-proofed for historical hanging. However it remains a loaded vernacular mark when positioned both for the history of the Celtic Tiger and Ahern’s legacy. Sigificantly the 2002 Fianna Fáil campaign poster reverts back to the old template with a daylit image of Ahern in his office safely framed by the party colors. 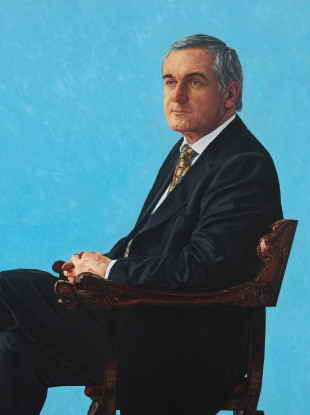 The official portrait of Ahern currrently owned by the State was painted by the artist James Hanley in 2004. It shows him blandly frozen, slightly askew and a little defensive. The pose here is reminiscent of the neutral expectancy captured on the faces of defendants used by trial court artists. When it was presented to the Dáil, a minor controversy occured when the subject of where to hang it arose. The debate that followed unavoidably coincided with more unsavoury revelations about Ahern’s finances. Hanley’s €10,000 painting inevitably featured as part of this dialogue much more than it would have liked. 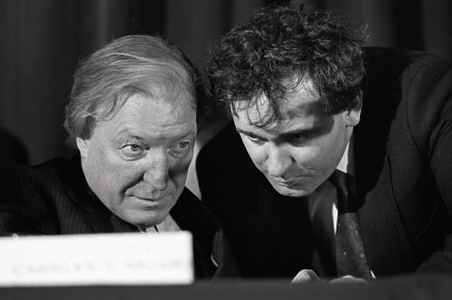 For a proven example, a quick search for images of Ahern lands upon a startling image of him with Charles Haughey in the 1980s. Haughey appears paralysed as something important on a desktop seems to have failed and so perhaps has the operator. A shadowy-eyed Ahern is on hand to take over. The black and white image is cropped and dramatic. Haughey’s famous comment on Ahern being ‘the most devious, the most cunning of them all’ is visually acted out here in the manner of turn of the century German Expressionism. This is just an example. In retrospect, many similar imagined narratives, based on what emerged from the tribunals, begin to write themselves as the combination of information and reclaimed images like this become more familiar. 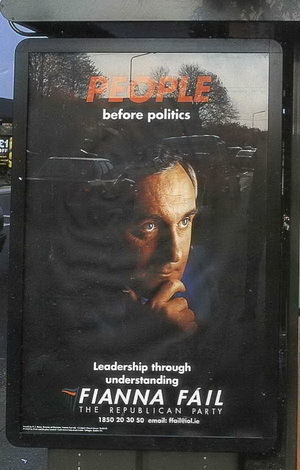 In Galway, a vernacular version of the 1997 campaign poster appeared. This startling version focused on a remake of the contemplative nature of the pose. It was home made and quickly achived popular status in the University town. Bertie, as the Taoiseach, was folksily known, looked stoned. Encouraged by the poster’s comedic visual opening, an unknown artist had Tipp-exed a large joint into Bertie’s fingers and coloured his eyes neon green. This stoned expression of leadership now spoke to a cohort far removed from Fianna Fáil ’s natural voter base but the incongruous text ‘People before Politics’ remained. 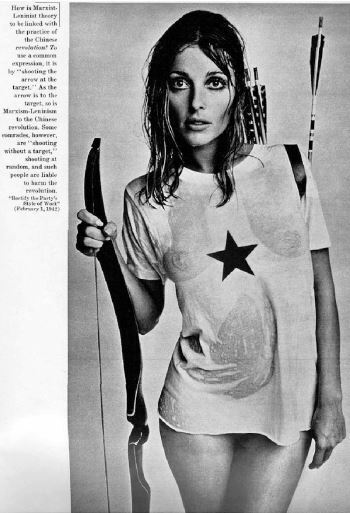 The style of the act was perhaps directed by contemporary culture that consumed the irrelevant ethos promoted in the labored photoshop examples which were featured at the time in Lads’ magazines such as Loaded. No matter what the inspiration was or how it came to pass, the ridiculous image of Bertie as Stoner in Chief totally rejected the gravitas of Fianna Fáil’s economic stewardship, certainly for a Galway audience who had the people’s Bertie propped up on rented mantelpieces and taped to the Dunnes Stores framed pictures provided by their landlords. It is safe to say the inital corporate look of the ‘untouched’ 1997 thinker image was imported from the presidential style favoured at the time by Tony Blair. 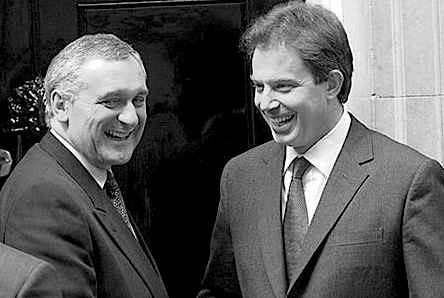 In fact, photographs from the first meeting of Blair and Ahern after the latter became Taoiseach in ’97 show the two men wearing nearly identical powdered grins and grey power suits. The transient gallery in Galway for image of the understanding stoned thinker was not unsuprisingly the accommodation of the student or service worker . These were the drones of the Tiger’s early phase, night owls who carried out the nightime ‘pull downs’ that liberated lamposts from an unwanted presidential gaze. They were gathering material for interventionist artwork and minor anti-propagandist resistance. Fianna Fáils corporate vision was regularly rejected and remade on the nightly trip home. This creative act took hold and proliferated. Before both the end of the offical and unofficial campaigns it was possible to buy the reconditioned image of a green-eyed stoned Taoiseach, so popular was the remake. Others began to follow the original artist’s template for similar versions briefly to be sold in Dublin. Each poster had to be removed and individually Tipp-exed yet all were similar and held the original text as part of the saleable concept. In responding to the intended depth of Fianna Fáil’s PR vision (and the audacity of its polished imagery) a successful minor countereconomy in the sale of the plastic printed image was led by Galway. The free market as anointed by Fianna Fáil was working and in a creative nod to the Blair project the remaking of the poster by non- artists celebrated the application of transferable skills demanded by the new economy. ‘’The piece was inspired by an interview Bertie Ahern gave in 2009 in the VIP magazine, responding to attacks from cynics, where he questioned the value of ‘pointing the finger’ and unproductive ethos of blaming others. I was stirred by Bertie Ahern’s response that we can either ‘dig the garden or grow blue bells’ or as he added do something useful. The portrait seems as though Mr Ahern is set-up for us to yet again point the finger at him, but in his gesture he is also waving back at us, as such throwing it back to us. 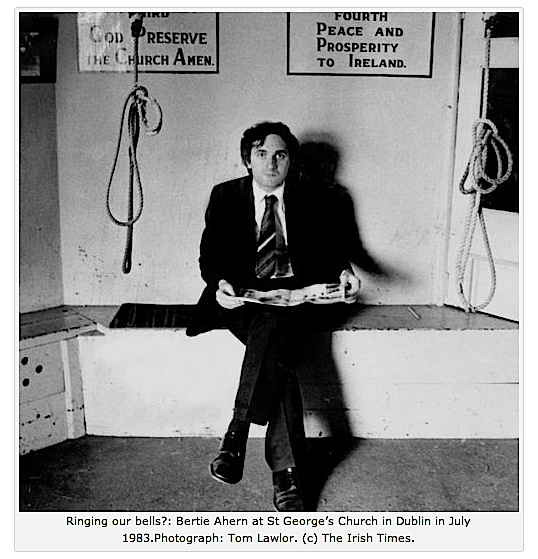 Briefly looking further back, a 1983 photograph of Ahern by Tom Lawlor on the comeheretome site shows the creative use of signifying props that is often the mark of the Irish Times in campaign coverage. Here Lawlor has emphasised the ‘caught’ nature of the subject framed by bell ropes that also hint at a hangmans gallows. The text on the wall ominously wishes peace and prosperity to Ireland. 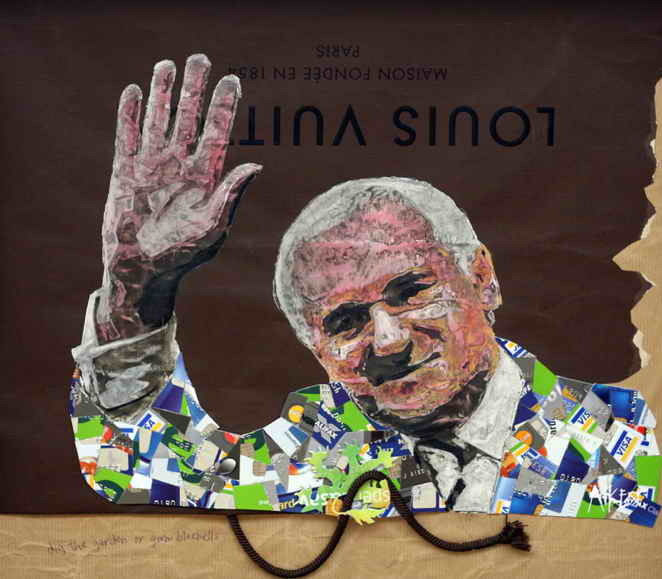 The Irish Times most notable image along the lines discussed is a front page foreshortened portrait of Ahern in a gymnasium as a basketball hoop seems to hover as a halo over his head. Again the seriousness of the then Taoiseach’s expression, in conjunction with the objects of a public space, was accentuated to his detriment. By the time of the Bertie in a Cupboard incident, representational fatigue on the subject had set in and derisive imagery was even expected. Sourcing was available from the media’s photoshopping to any amount of rants on social media. 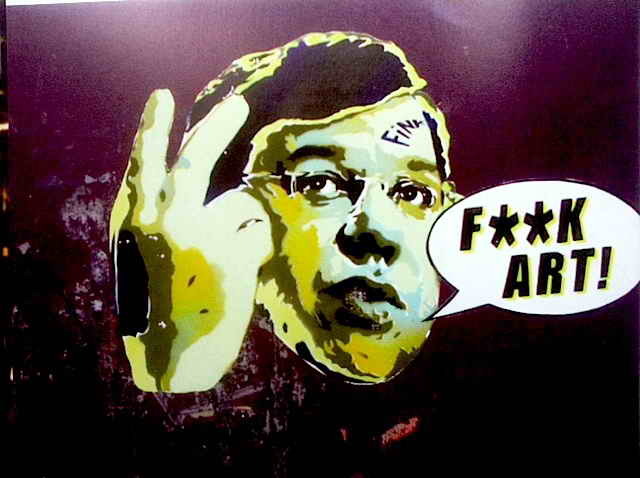 His sucessor Brian Cowen was now in place and was also a target for the backlash. He even attracted painted abuse in 200 when the painter Conor Casby famously, and illegally, inserted the image of Cowen as a leader stripped of his robes into the National Gallery. As for Ahern? The commentary surrounding his tenure built towards straight digital abuse as his facade crumbled. Ahern ceased to hint that he may run for president and reduced his media appearences as the mounting and unforgiving commentary began to mould his legacy. The image of the green-eyed stoner is a physical mark from a pre-Youtube Galway and may only exist in the image I had the opportunity to record. I photographed the image then as the ubiquity of Ahern’s official image truly seemed to represent an unassailable neoliberal chieftain who promoted the interests of those who filled what was then known as the ‘Galway Tent’. In 1997 this remake struck me then as the only art-led counter-commentary being practised in traditional Agit-Prop style. It was above all funny as was the concept of refusing to salute the chief but instead taking him home for a joint in a houseparty in Rahoon. There was testimony in this, even then, that there was more to Ahern’s public image than met the eye.